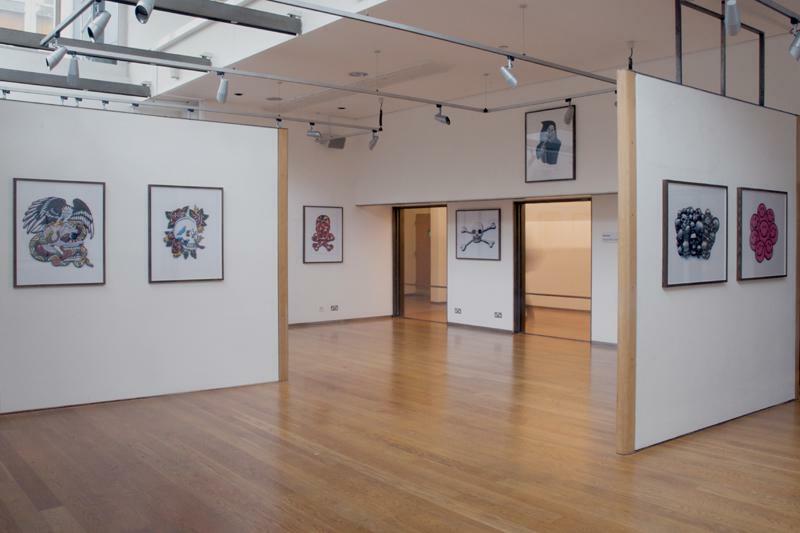 Recently opened in the London College of Fashion’s Fashion Space Gallery is an exhibition of photographs by Alan Kane. 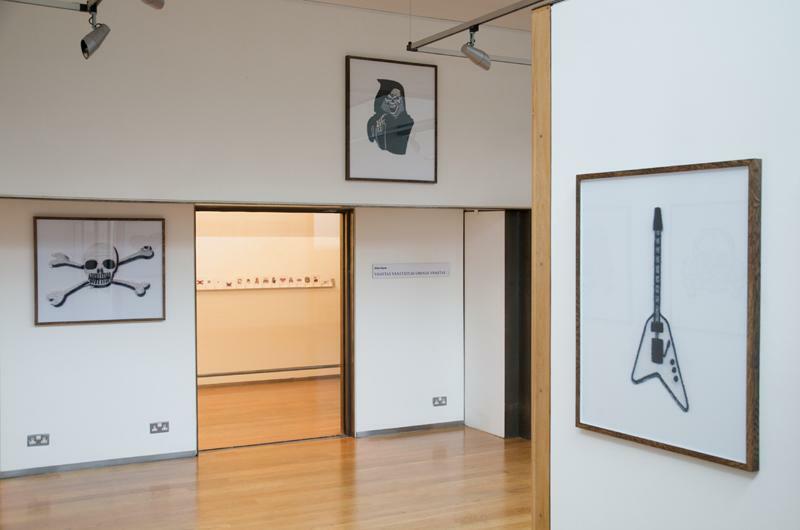 Put together to celebrate the end of the artist’s year-long residency at LCF, this small show reflects Kane’s continued interest in and examination of the peculiarities of the human penchant for collecting. 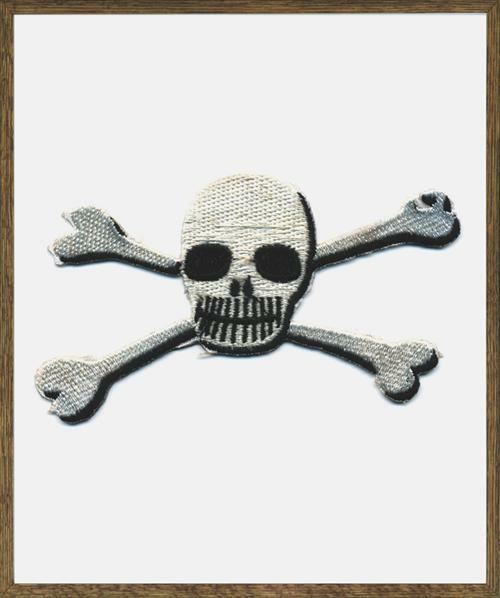 Each of the twenty or so photographic prints shows a single fabric patch, a machine-stitched emblem that can be ironed or sewn onto clothes to add embellishment at the wearer’s discretion. This idea of personal adornment is redolent of Kane’s almost anthropological interest in the small-scale rituals of everyday life, the kind of processes that are neither instigated nor directed by the state or organised religion. 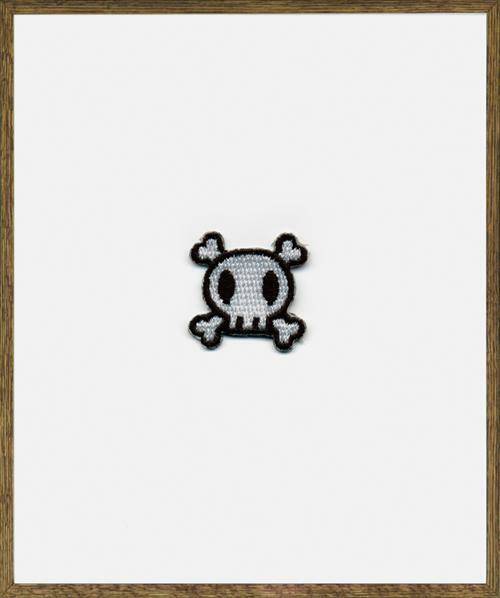 The fact that almost all of the patches in the exhibition are human skulls is representative of this; as Kane himself says, ‘I think it’s…a death-defying ambition which is quite interesting, and at the same time it’s’[as though the wearer is] defying authority’. Kane cites the skull, particularly as added to clothing, as being popularised by Hell’s Angels and later ‘teenage boys and girls that want a bit of Hell’s Angels about them’. 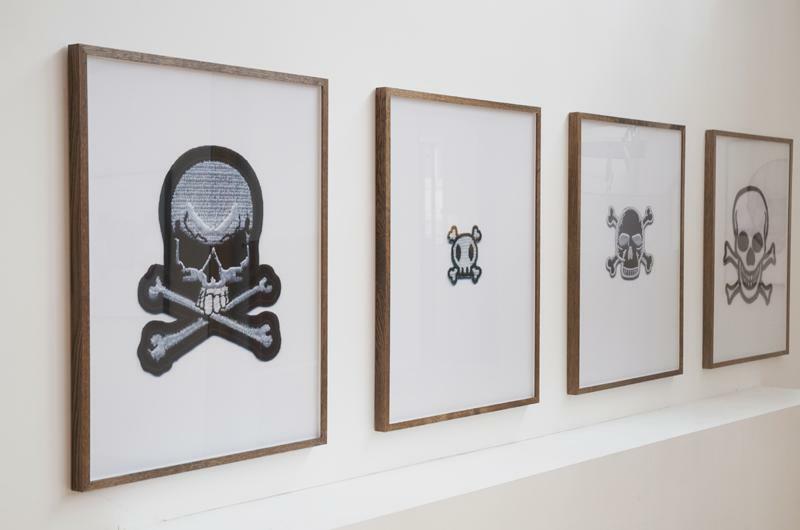 Kane’s observation of the skull as an anti-authoritarian signifier in popular culture might be questioned when we consider that one of the prints included in the exhibition featured a helmeted skull above crossed Ak-47s with the slogan ‘U.S. ARMY: mess with the best / die like the rest’. Perhaps the state has embraced death as much as the punks, and if this is the case we might justifiably substitute ‘art world’ for ‘state’ and ‘popular culture’ for ‘punks’. 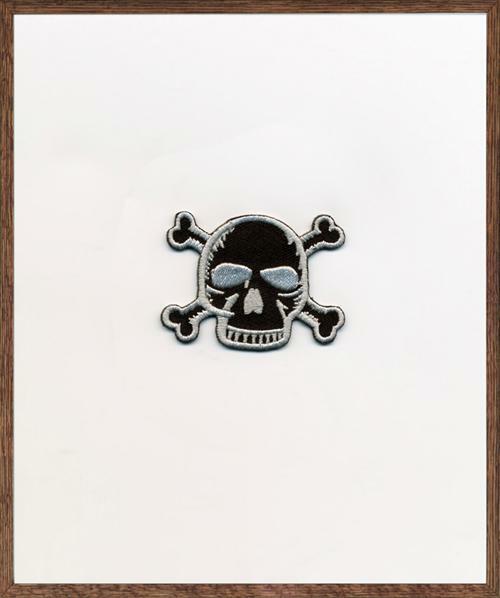 This is certainly true when we consider the use of skeletons in contemporary art of the last fifteen years: Gabriel Orozco’s Black Kites (1997), Damien Hirst’s Floating Skull (2006), Shirana Shahbazi’s Flowers, Fruits & Portraits (2007) to name but a few, point to a continuing engagement with the way we react to the skull, particularly when its context is the art gallery rather than the album cover, the tattoo or the fabric patch. Kane insists that ‘there’s no separation between people and art’it’s not somewhere else. 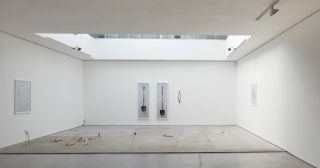 But the art world proposes that it is’And I suppose in the broadest sense I propose that that’s not the case.’ Everything points towards the link made by Kane, both in the title of this show and in its subject matter, between the ‘high’ art Vanitas paintings and the ‘low’ art of these mass-produced objects. I would suggest that this comparison is slightly skewed, however: the inclusion of a reminder of death in a seventeenth-century Dutch still life was intended to guide the viewer back towards morality and a life lived in fear of God. 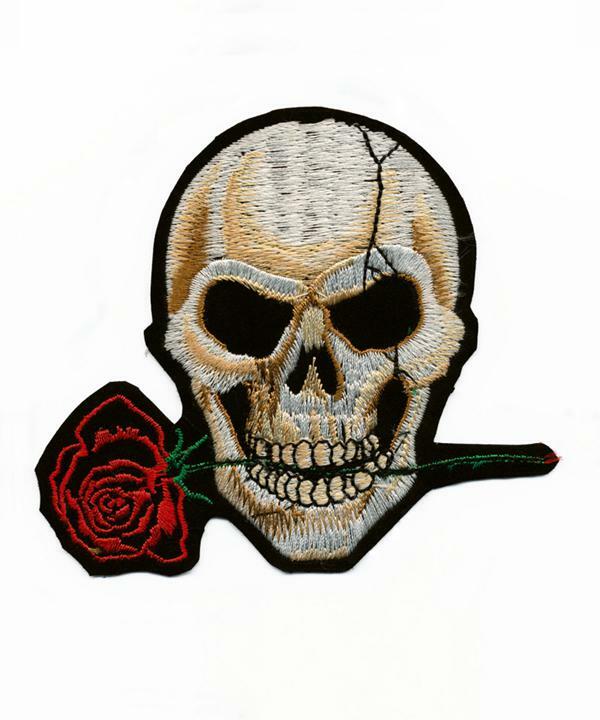 It is arguable that the Hell’s Angels lifestyle that popularised these skull patches is not exactly a modern equivalent. 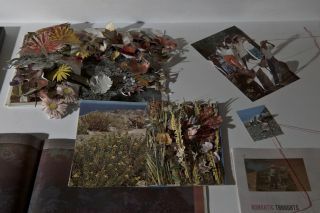 It is the displacement of the patches from the world to the gallery (and that separation does still exist as one of the gallery’s primary functions) that better reflects Kane’s interest in what he describes as ‘taking unassuming objects and displaying them in an auspicious setting’using the gallery as a kind of amplifier, as a magnifying glass perhaps.’ The format and concept of the exhibition appears to follow on from The Stratford Hoard (2008-9), which took the collections of people living in Stratford and displayed them, both physically and in the form of documentary photographs, in Stratford station. These assortments of objects included souvenir teaspoons, Beatles memorabilia and wind-up toys, and had been accumulated by their owners over years, if not decades. Kane does not view this exhibition as evidence of a personal collection - he even admits that he is ‘kind of adverse to collecting’. 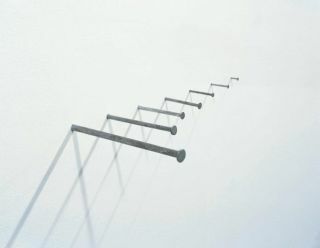 Although his role as a collector is thus far short-lived, Kane’s strength as an artist lies in acute observations of the social practices of the society in which he lives, and in his belief that the practice of art is a social rather than an institutional one. It seems that the signs and symbols of rebellion on show at LCF might just be more than representations of vanity. All quotes taken from an interview with Alan Kane, conducted by the author.